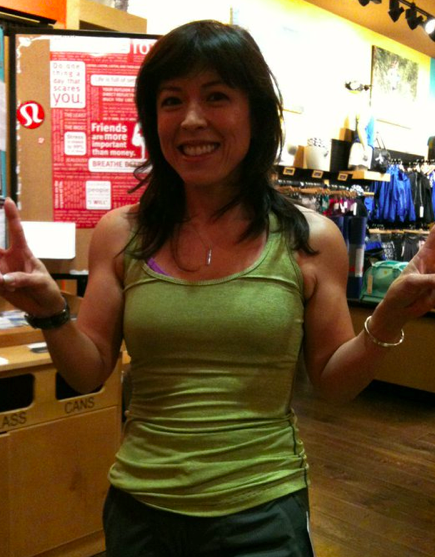 This is a new Cool Racerback out in Ala Moana Lululemon and according to reports it’s Micro Stripe Wren. I would have never have guessed this was Wren but the Micro Stripes really do play with the colors. To me this looks very, very green where as Wren just looks Brown with a touch of green but because the Micro Stripes are Bright Yellow with Wren Wee Stripe from a distance it looks green. I suspect the bright yellow (Split Pea?) is actually Rubber Ducky Yellow which makes me really excited because I’m infatuated with that color. These are the Cropped Dance Studio Pants in Wren and also available in Coal. "New! Dance Studio Crops and Scoop Neck Tank"
"Product Alerts From Down Unda!"